If you've already created professional looking HTML e-mails you've probably experienced that the e-mails are rendered differently in various e-mail clients (Outlook 2010, Gmail etc.). The reason is that different e-mail clients and even the same clients with different versions render CSS definitions differently. That's why it is important to test your e-mail in the most common e-mail clients before you send it to thousands of subscribers especially to those that render CSS differently. The most common e-mail clients with poor CSS rendering capabilities are the following: Microsoft Outlook 2007/10, Google Mail (Gmail) and Windows Live Hotmail. If your e-mail is rendered well in these clients then probably other clients will render it properly. SalesAutopilot also has a built in testing function that provides a preview of your email in 48 variations of the most popular email clients and mobile devices. This means an extra 2 Euro / e-mail cost. It's not necessary to test each and every e-mail with it, but we strongly recommend you to use it to test your new e-mail templates. Read more about it here. Always test your e-mails by sending them to your own test e-mail addresses in the most common clients. Open an e-mail from the left menu by clicking on its name. Click the "Test delivery" button in the delivery schedule. First select the users you want to send the test e-mail to. Select a user from the "Add subscriber as addressee" dropdown list and click to the "Add" button. The user will be added to the list with his/her e-mail address. The program also saves whether the list includes a "first name" and a "last name" field. If there is no user with the e-mail address you want to send the test delivery to then you can add a new user in the Users menu. If the e-mail contains merge tags you can set their values by each user separately. So the e-mail will be sent merged with these values. You can type or change these values in the input fields next to the e-mail addresses of the users. The given values will be saved in the list so they will remain for the next test delivery. The next step is to check to which users you want to send the test e-mail. Click on the checkbox right before the e-mail address of the user to select it. The test e-mail will be delivered to the selected users only. SalesAutopilot will store the selections so they'll be checked at the next test delivery. 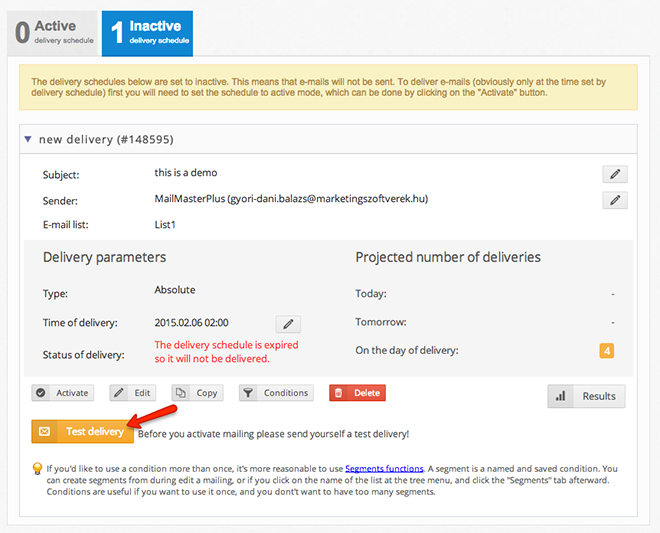 To start a test delivery click on the "Send test e-mail" button at the bottom of the screen. The e-mail is sent immediately to the users independently of whether it has been sent to them before or what condition is set to the delivery schedule. The next screen shows the result of the test delivery i.e. which users have received the test e-mails. If you want to resend the test click the "Send another test" button, otherwise click the "Close button".